Tuesday, 23rd Dec 2014. 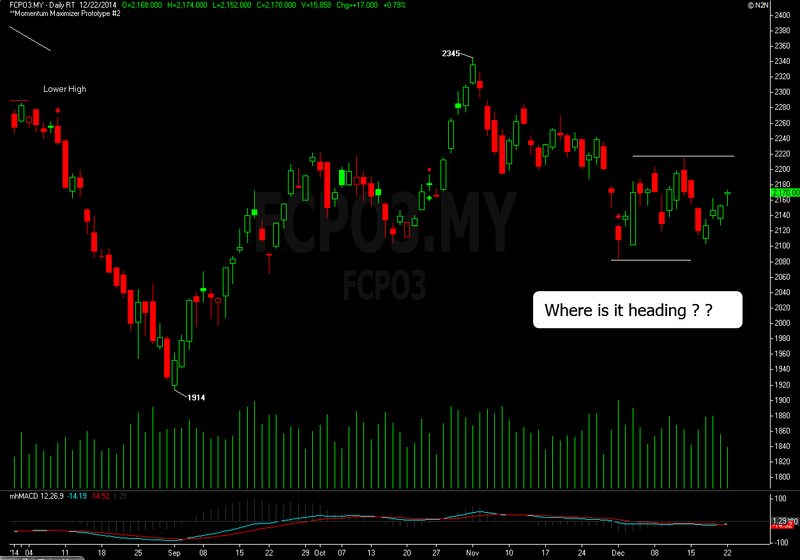 Palm oil futures is running on undecided path, moving in and out from week high to week low since early November. Other news to follow. "- The S&P 500 and Dow Jones Industrial Average ended Monday at new records, fueled by continued hopes that the Federal Reserve won’t be in a rush to raise interest rates. The main indexes booked their fourth straight day of gains, abetted by a central bank that last week reassured investors it will be “patient” about the timing and pace of rate hikes. The S&P 500 SPX, +0.38% gained 7.9 points, or 0.4%, to 2,078.55, closing at a record for the 50th time this year. This is the highest number of record closes in a year since 1995. Gains in technology and telecom stocks outweighed sharp losses in energy and health-care companies. Gains were even larger for the Dow Jones Industrial Average DJIA, +0.87% which rose 154.64 points, or 0.9%, to 17,959.44. The blue-chip index closed at a record for the 35th time in 2014. All but three of its 30 components ended with gains. The Nasdaq Composite COMP, +0.34% ended 16 points, or 0.3%, higher at 4,781.42." "-Asian stocks were mostly higher Monday, taking their cues from greater stability in crude oil prices and the Russian ruble, along with the Federal Reserve’s indication it will take a slow approach to raising interest rates. Australia’s S&P/ASX 200 XJO, -0.61% was up 1.5% to 5420.90 and the Shanghai Composite Index SHCOMP, -1.78% up 1.2% at 3144.61 as concerns eased over further instability in global market conditions. Japan’s Nikkei NIK, +0.08% treaded above and below the break-even level, a possible indication that it may be difficult to retain upward momentum after three consecutive gaining sessions in Tokyo last week. At midday, it had edged higher to 17621.66 amid thin trading." "-Oil prices slumped again on Monday, as comments about maintaining production from several OPEC ministers sparked a renewed selloff. Saudi Energy Minister Ali al-Naimi said the Persian Gulf nation will maintain its oil production and may even increase it if a new client emerges. The comment is the latest signal that the largest oil producer is unlikely to cut production in response to a massive drop in prices. On the New York Mercantile Exchange, light, sweet crude futures for delivery in February CLG5, +0.69% gave up earlier gains and settled $1.75, or 3%, lower at $55.38 a barrel. February Brent crude on London’s ICE Futures exchange LCOG5, +0.27% reversed earlier gains and was trading slightly above $60 a barrel." There is always some direction in the smaller time, but I doubt there is any good direction if you are looking at hourly chart and above for the moment. Most of the trend following indicators are having tough time deciding which one will provide ample return to the position. Ample return would mean enough juice to provide those trend trader at least 100 points profit, at least in my case. A generic trend following indicators may require price to move at least 150 points to 250 points from the trade to turn to be a profitable one. This is because market need to move in line with the break out / break down or after it breached a new high / new low for at least 150 points for the trend following system to pick up the trade and ride it. It is a long shot for most people and choose not to use trend following because of the low hit rate or low winning rate. Most of the trend followers would felt their system is highly tested from November and maybe until the beginning of Feb 2015 as there would be no promising trend to pursuit at that time. Back to the outlook, the March contract is likely open slightly lower today judging on Soy oil weaker price. Range for this week is likely to be 2,190 ~ 2,130 and there is less likely price would move in line even after this range has been broken. In other words, it is unlikely to see any conviction move even if the March contract manage to breach above 2,190 or break below 2,130. Conclusively, market is still trapped in sideways mode this year.